When you're looking for a relaxing way to spend a day, there's nowhere quite like the beach. Coastal locations are hugely popular all around the world, with people of all cultures and backgrounds stepping out onto the soft sands of their local beaches each and every day to admire the majestic sights and sounds of the ocean waves. Beaches can be the perfect places to get away from the stress of modern life and the noise and smoke of the city. They allow everyone, regardless of age or background, to simple sit down and relax, forgetting their troubles and getting in touch with nature, as well as offering all sorts of fun activities like swimming, scuba diving, jet skiing, and more. All around the world, Hawaii is known as one of the very best beach destinations anyone could ever hope to see. The Aloha State, which is made up of multiple islands, has a whole lot of coastline to explore and boasts some of the very best weather conditions and warmest waters of any location on Earth. Oahu is the third largest of the Hawaiian Islands but is generally regarded as the primary island of the state, being home to over 60% of the state's population and also housing the state capital of Honolulu. The southern shore of Oahu is best-known for being home to some of the island state's most iconic beaches like Waikiki Beach and Kuhio Beach, but the northern shore of this Hawaiian island has a lot to offer as well. With long, uninterrupted stretches of coastline in both directions, back by beautiful tropical jungles and stunning scenery, the northern shore of Oahu is home to a lot of must-visit beaches. Whether you're looking to surf, swim, snorkel, or simply kick back and relax, the north shore will have a bunch of beaches to please you. In fact, there are so many great beaches on Oahu, it can be hard to choose between them. With that in mind, we’re helping you narrow down your search by highlighting some key information on the best northern Oahu beaches below. Perhaps the best-known beach on the northern shore of Oahu, Sunset Beach is named for the fact that it's definitely one of the best places in all of Hawaii, if not the entire world, to watch the sun go down. The sky lights up with a full spectrum of reds, oranges, and golds as the sun sets each night, casting a unique pattern of colors that changes every single day. Lots of people gather here in the evenings, but it's a lovely beach in the daytime too. Restrooms can be found on site, along with ample parking opportunities, and lifeguards are always on duty here to the popularity of surfing at Sunset Beach. Laniakea Beach is arguably the number one spot for nature and animal lovers on the northern shore of Oahu. Why? Well, this beach is home to a whole lot of sea turtles, so you're almost sure of spotting some at any time of year. 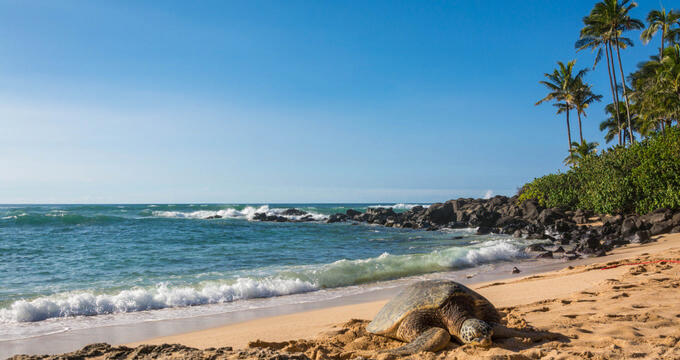 Turtles can be seen both on the shore and out in the shallow waters off the coast, but all visitors are encouraged to let the turtles go about their business without interfering. Getting too close to them could interfere with their natural ecological cycles and may result in a heavy fine. This beautiful beach is very popular with the local Hawaiian communities. The local harbor is a popular gathering spot to watch the sunset, and the beach itself stretches out over 19 acres of land. Both grassy and sandy areas can be found here, providing the perfect backdrop for happy picnics with friends and family, and the beach itself is perfect for all kinds of activities including surfing, diving, and fishing. Visitors also have easy access to the local town of Hale'iwa for eateries, stores, and other amenities. The largest of all Oahu north shore beaches, Waimea has more than enough space to handle the huge crowds that can congregate here throughout the year. It's a very popular surfing spot, with some truly impressive waves reaching heights of 30 feet or more on rough days. Due to the popularity of this beach, you might need to walk around a little to find a good spot to set up your beach towels and umbrellas, but once you find that spot, you'll be rewarded with some truly unparalleled views. Also known as Lost Beach, because it appeared in the TV show of the same name, Papa'iloa Beach is another of the top surfing spots along the northern shore of Oahu. The waves in this area even earned the nickname 'Himalayas' due to the heights they can reach. This is also a good spot for wildlife lovers, with sea turtles sometimes being spotted along the shore. The rocky spots around this beach make it unsuitable for swimming, but if you're an experienced diver or spear fisherman, you'll find plenty to love at Lost Beach. The thing that really separates Three Tables Beach from other Oahu beaches is the scenery. The beach earned its name due to the three rock tables that formed here, resulting in some very special rock formations that you won't find anywhere else. This is a very sandy, cozy little beach that can be a lot of fun to explore and walk around. Swimming is great here as the coast slopes gently out into the water, and snorkeling is quite popular at this Hawaii beach as well.